Naples, Fla. (April 18, 2019) – According to the March 2019 Market Report released by the Naples Area Board of REALTORS® (NABOR®), which tracks home listings and sales within Collier County (excluding Marco Island), the median closed price of homes decreased 5.6 percent to $340,000 in March 2019 from $360,000 in March 2018. 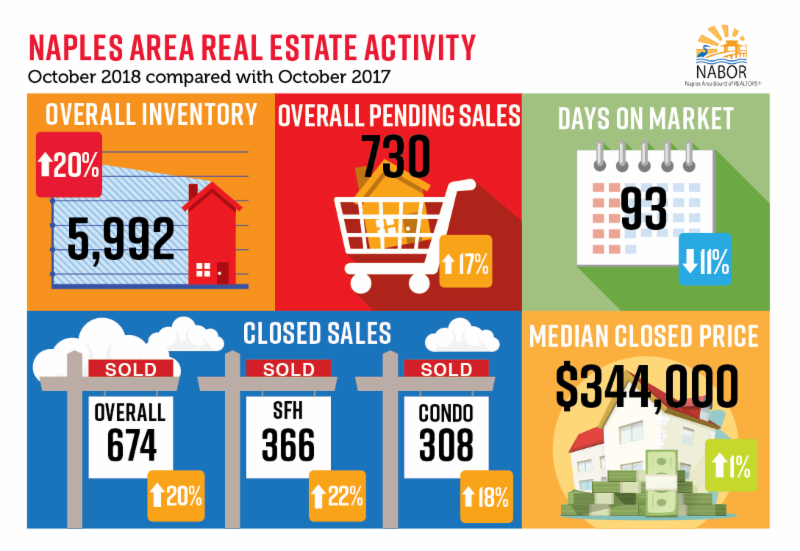 Broker analysts reviewing the report clarified that the median closed price decrease was due, in part, to an increase in the number of closed sales of homes priced under $500,000 during the last year. Another reason for the decrease in median home price is due to sellers pricing their homes appropriately – based on actual comparisons of recently sold homes – to gauge their home’s estimated value rather than pricing their homes based on unvalidated values. 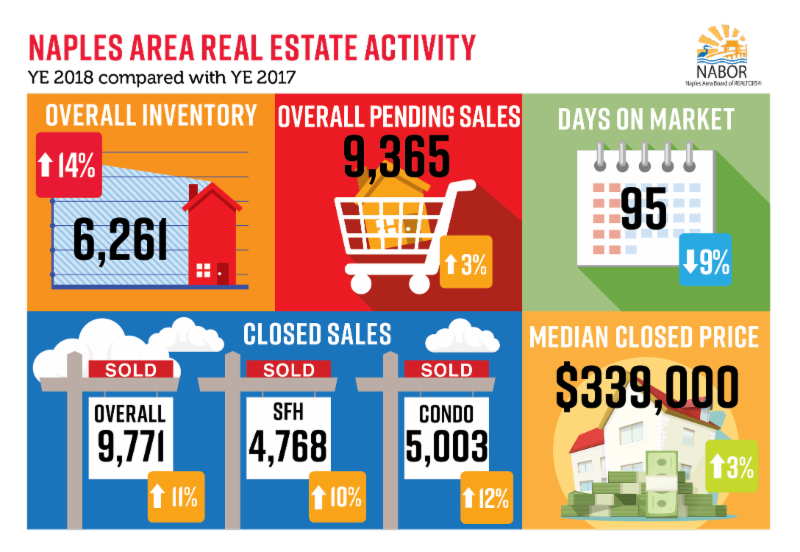 Geographically, the median closed price for condominiums in the Naples Beach area (34102, 34103, 34108) increased 13 percent to $805,0000 in March 2019 compared to $711,500 in March 2018, the highest increase of all areas reported. The median closed price for single-family homes increased the most in South Naples (34112, 34113) by 2.6 percent to $410,000 in March 2019 compared to $400,000 in March 2018. 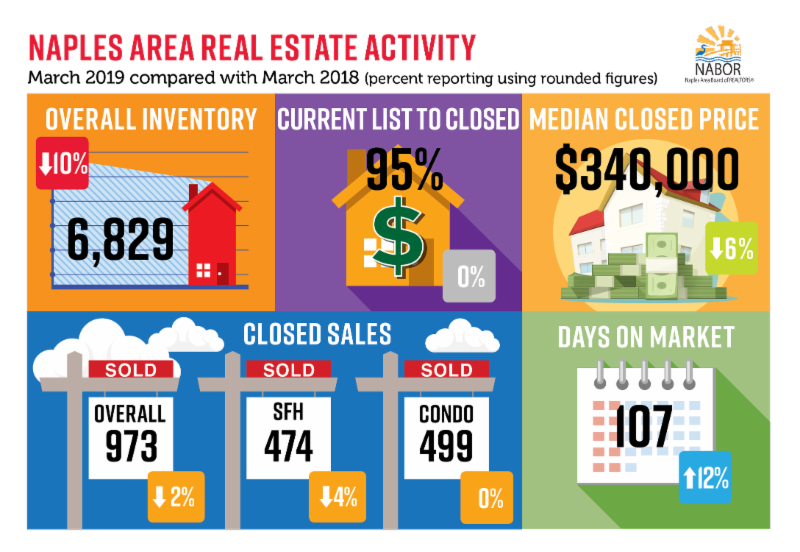 Inventory during March increased in only one segment and place: single-family homes in the Naples Beach area. 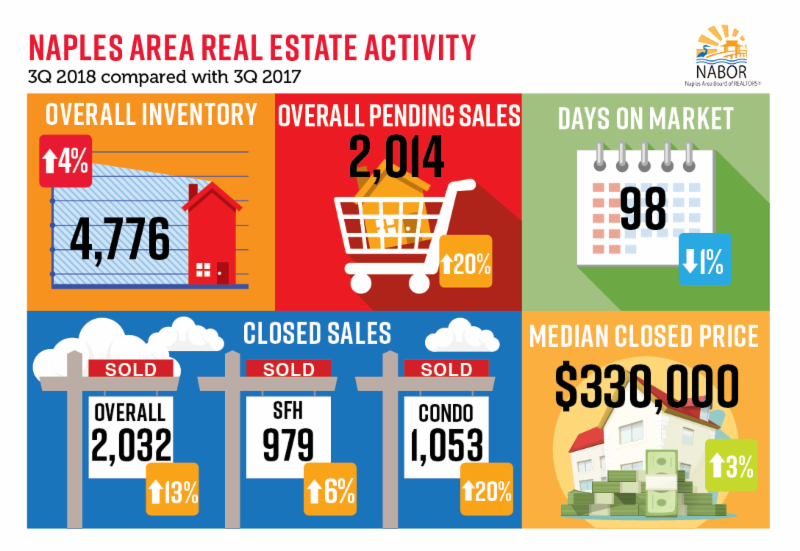 This area’s inventory increased by 4.1 percent and is where a large majority of “spec” home building is taking place. Brokers reviewing the March report also discussed their concern about how water quality issues and short-term rental limits might impact the Naples housing market moving forward. Adam Vellano, West Coast Sales Manager, BEX Realty – Florida, and a member of the NABOR® Water Quality Task Force, remarked that actions by the new Governor to fast-track many delayed water-quality projects, appoint a new South Florida Water Management Board, and request the Army Corps of Engineers modify Lake Okeechobee’s scheduled releases so there are fewer in the summer, is already being met with positive response. “If the county puts limits on rentals we may see a spike in inventory,” said Mike Hughes, Vice President and General Manager for Downing-Frye Realty, Inc., who added that a limit would be bad news for a good portion of our seasonal residents and the homeowners and investors who benefit from a healthy rental market. Huskey responded that “a move to restrict rental lengths to the term suggested could significantly impact sales in some areas of unincorporated Collier County.” As it stands, his company already has an 85 percent rental reservation rate for next season which shows confidence in the market. Prices are expected to remain stable over the next 12 months according to Carroll, who also noted that some pockets of the market may begin to see value erosion while others continue to increase due to location and demand. Geographically, inventory increased the most in Eastern Collier (10 percent) and Ave Maria (18 percent). Colder winters up north are bringing more visitors to the Naples area Naples area homes are selling faster (average days on market decreased 9 percent from list to closing)Buyers interest in the Naples market is on the rise as a result of aggressive builder advertising in northern marketsMore comparable home prices are available with the increase in inventoryLocation, location, location continues to appeal to home buyers Inventory is increasing which translates to more options for home buyers There are as many condos for sale as there are single family homes which expands overall opportunities for home buyers (Total: 6,261)The stability of the overall median closed price builds buyer confidence in the market Mortgage interest rates are currently low (< 5%) spurring home buying decisionsLocation, location, location continues to offer appeal! 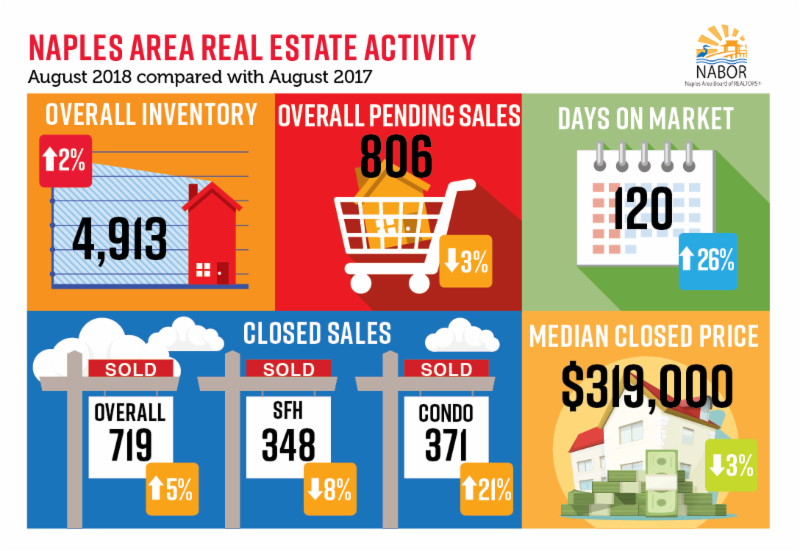 Even though the Southwest Florida MLS system is not as widely used by REALTORS® working in commercial real estate in Naples, the data collected does help agents gauge this sector of the market. According to Wes Kunkle, President and Managing Broker at Kunkle International Realty, “Vacancy rates for commercial properties are low right now. 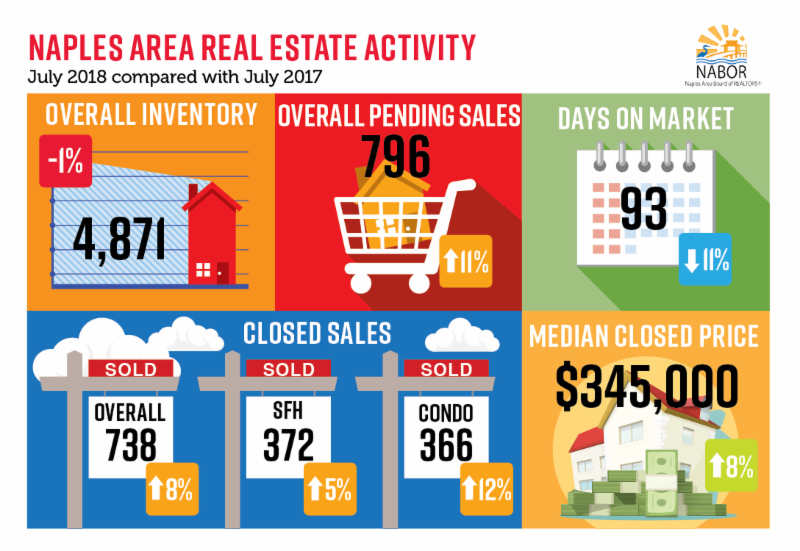 I’m seeing most vacancy rates well under 5 percent.” Historically, commercial real estate activity is directly affected by the residential real estate market. When nearly 1,000 more homes are sold annually compared to a previous year, as was the case between 2017 and 2018, it is realistic to expect the number of businesses will increase to meet the needs of those new consumers. Dozens of new commercial properties are in various stages of development across Collier County, many of which have large grocery store anchors.